Hi everyone! I am so excited to be your Growing In Unity gal this week! The last time I did this was in 2011 and I am STOKED I was able to get in this year when sign ups occurred. It was totally meant to be, too, because the fates aligned and I'm showcasing during my birthday week which is this Friday! Be sure to leave comments on my GIU posts each day this week because at the end of this fun week, I get to choose TWO of you to win an awesome grab bag of 25 Unity Stamps! For my card, I used the set Blossom by Blossom. This set is so beautiful - I love all the different sentiments and this beautiful flower image. I used Faber-Castell gelatos to apply color to the flowers and then spritzed with some water before stamping in a random pattern on the front of the watercolor card. After that I took a wet paint brush to blend the colors. Once it was dry, I stamped my sentiment in Tsukineko Versafine Onyx Black. Some twine, sequins and wood veneer finished off this simple card. You could easily make a lot of these with the different sentiments in the set and different colors of gelatos for a great gift set. I hope you've enjoyed my card and be sure to stop by tomorrow for more GIU loveliness as well as another chance to comment for your chance to win! Oh my goodness! I love this card so much!! Love the colors and the sentiment. The whole this is just beautiful!!! So sweet, I absolutely love it!!! Great job!! Thanks for reminding me to use my Gelatos! I love the colors you put together…. Love the soft colors of this card. I am excited to see your creations this week. Happy Birthday week. Celebrate, Celebrate, Celebrate. Happy birthday to u! What a beautiful card! I absolutely love the sentiment! Beautiful card. Congrats on being the GIU gal this week. Congrats on being the GIU girl this week Carisa! It isn't always easy getting in! Love your card and the soft sweet colors you used. You've inspired me to go in my craft room and play with my Gelatos!! Congrats on your GIU week! I'll be checking in each day to see your creations! 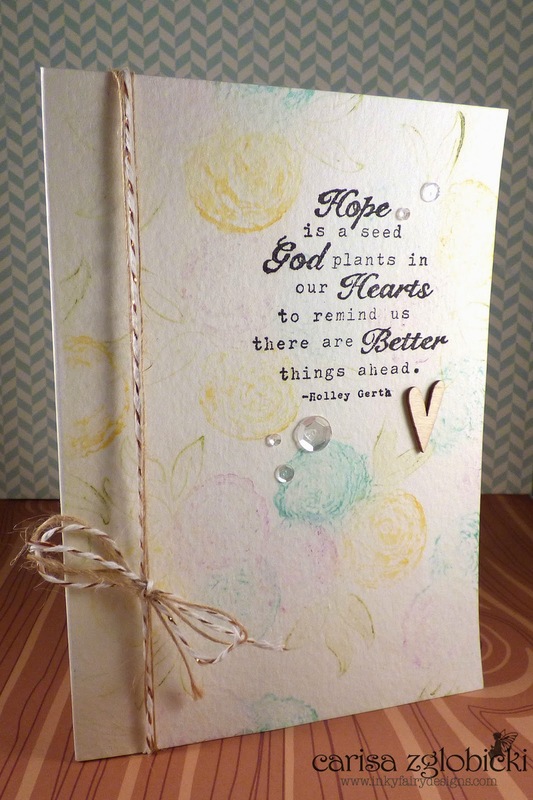 Love today's pretty card with its soft colors! Lovely sentiment and wonderful background. I love this quote (& your card, too)!! ooohh, love the background you created! And also love your embellishing and twine! Thanks for sharing. Happy Birthday WEEK! I love birthdays and yes, it was meant to be if this card is any indication of how this week is going to go in your creative world. Stunning design. I'm in love with your card and that beautiful sentiment. Love the subtle and soft florals! Such a beautiful card!!! Love the words & your colors. A perfect match! Congrats on being the GIU this week! !That card is amazing---love how you used the Gelatos! Congrats! Simply stunning card! I have yet to invest in gelatos, I hadn't seen the diversity these offer until now! Thanks so much for this cool technique idea. Beautiful! I love the soft colors of the background! That flowered background is amazing! What a beautiful card! The Blossom by Blossom stamp never looked so pretty. I need to order this one. 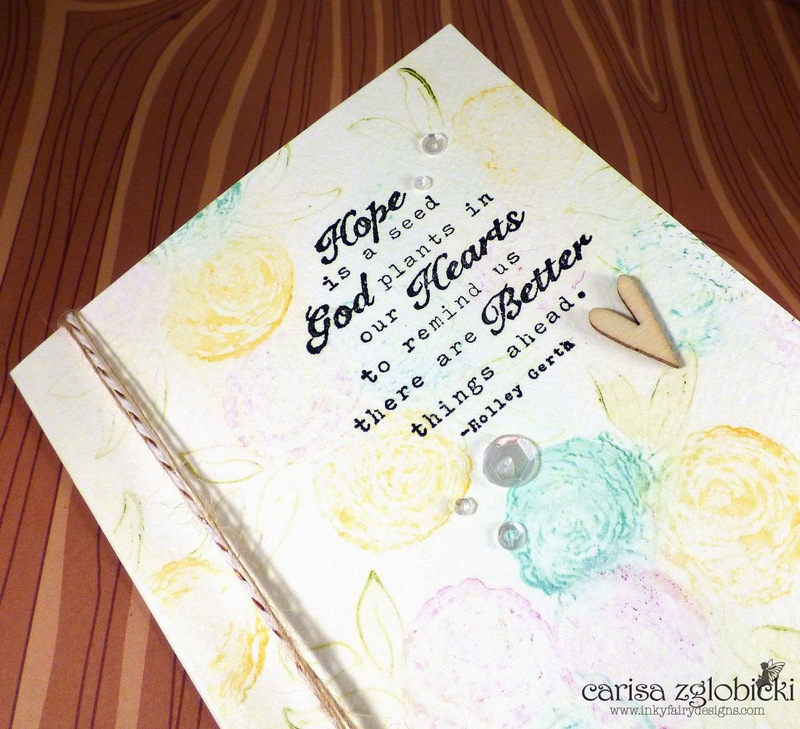 Love the way you used watercolors with this stamp! This is so soft and pretty. The sentiment just warms my heart too. Love this!